With the advent of more and more Japanese anime and manga influences on the American pop cultures, in particular science fiction, it was only a matter of time until this would also develop into and effects RPGs and gaming in general. 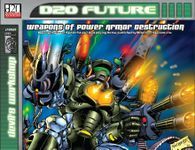 With this influence, the conception and development of the mecha rules of D20 Future were created. Now while many think of the term, mecha, being only large battle suits that tower over skyscrapers and office buildings and size is equal to several city blocks, smaller armored suit of high technology battle armor; similar to what Iron Man and War Machine of Marvel Comics and even the Cyclone Armor from Robotech: The New Generation wear; normal called Power Armor was an oversight in the creation of these rules. This supplement and sourcebooks was created with the development and creation of Power Armor for small tactical military groups in mind in a skirmish type setting. These Power Armor rules have been created to close the gap between the typical infantry soldier and the large-scale mecha weaponry.